The one thing that I want for the musicians and bands who make the music that moves me is for them to never have to have a day job…unless that day job is making music. 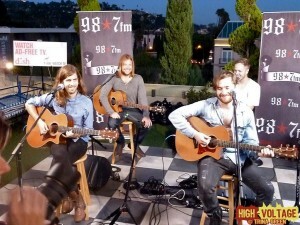 It’s Labor Day Monday and the eve of the release of Imagine Dragons’ full-length debut, Night Visions and the band has made themselves comfortable at the FM 98.7 Penthouse at the Hollywood Tower apartments. There’s a lot that I could try to say with an abundance of wordy flourish in an attempt to sound literally poetic and deeper than the BP oil spill, but I’m not going to go there. The album that dropped yesterday? 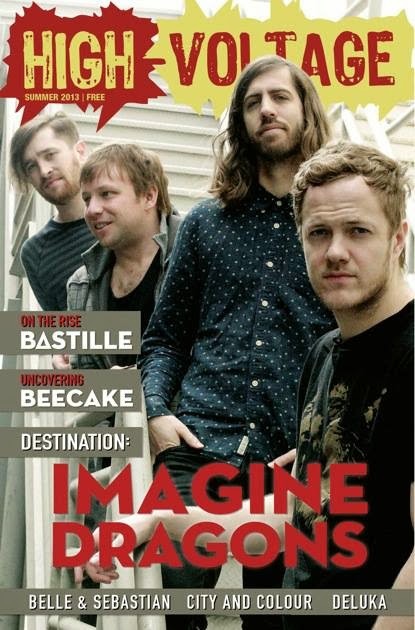 We at High Voltage Magazine heard it in early August and it made us happy. Made us do that stomp-clap-stomp, stomp-clap-stomp thing (I’m getting better at it, I swear) with goofy grins on our faces. You see, this is the point in the program when people like us, like you – music fans – know with all of your hearts that the time, energy, money and support channeled into believing in the music and watching those who make it explode before our eyes has been a one of a kind emotional investment that repays itself with intangibles. And that’s because I think that many of us are more than just fans of music: Music is also a friend and we try to treat it and those who make it as such. But I’m also just one of so many who have watched Imagine Dragons (a band less than four years old) evolve from a five-piece to a four-piece, from a baby band first on an evening’s bill to sold out, sweat dripping from the ceiling shows at the Viper Room, a place that feels like home to them (and believe me when I say that Viper regards them as family). 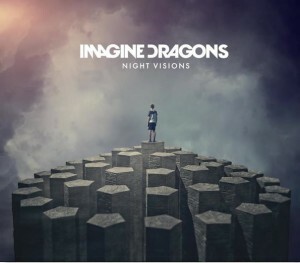 And like so many, once upon a time I heard an Imagine Dragons song and immediately decided that I needed to hear more. Somewhere between that impromptu weekend when I and two friends with little planning drove to Las Vegas for a show where Imagine Dragons were on the bill, their shows in Los Angeles and our own editor, Chelsea Schwartz, booking them for my birthday show at the Viper Room (Dan’s birthday happens to be the following day) something happened. Attachment. Then they kept returning to Los Angeles and playing with local bands and friends. Affection. And then their lives became interwoven by marriage with two other local LA bands/friends that I love and… Love. The fact is that this moment is what we music fans and friends of those in bands who work their asses off towards greater things fervently hope for yet simultaneously fear. We gladly, enthusiastically act as cheerleaders, photographers, street teamers, bloggers, town criers aka people who just won’t shut up about them until everyone has listened to us and is listening to them. And for those bands we wish every form of personal and professional success and happiness (platinum record sales, tour buses, groupies, world tours, no green M&Ms) in repayment for the honest joy the music gives us. With that comes accepting the possibility that we may never see them in the dripping sweat and close comfort of a Viper Room again. But at the end of the day it’s okay because the dreams are coming true, the hard work is paying off, the passions are being followed and all of those things showed on Monday at the FM 98.7 Penthouse. 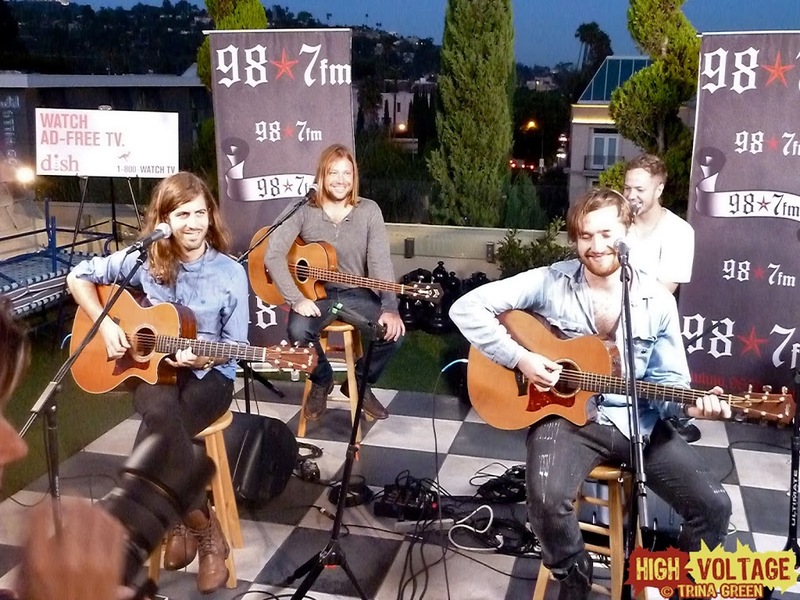 Imagine Dragons played a short acoustic set that was more personable and warm than business professional as Dan, Wayne, Ben and Platz took their normally electric and anthemic chorus rockers and reigned them in, softening them with an intimacy that flowed into a Q&A session. With his usual gentle humility, Dan spoke of the road that the band has traveled to get where they are, vocal cord surgery, what an awesome catch Ben is, following a dream, insomnia, the Viper Room, truth in songwriting and the combination of fear and excitement about what comes next. What comes next is their turn on the Jimmy Kimmel Live stage, a national tour, then…who knows. I do know that every little success makes our hearts smile. We don’t claim any responsibility for Imagine Dragons’ achievements; we’ve just had the honor and pleasure of watching them as they occur. And to the simple music fan in us, that is a precious gift. If you’ve read our current High Voltage Magazine cover story (Summer 2012), you know that there are entirely too many variables that are involved in why a band does or does not break through to success. 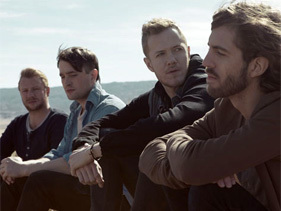 But where Imagine Dragons are concerned – after you factor in the drive, determination, hours in rehearsals, hours on the road, long days and longer nights – the one true explanation is the one that they will sing every night, at every show for the rest of their career-lives: It’s their time.